Two of Canada's most intriguing live acts are teaming up for a six-date tour of Ontario. Montreal-based synth punks Duchess Says will be headlining the trek with art rockers Yamantaka // Sonic Titan, who have been largely dormant since releasing UZU in 2013. The joint journey will kick off November, starting with a show in Windsor on November 20. It will then make its way to Hamilton, Guelph, Toronto, Kingston and Ottawa. If past shows are anything to go by, you can expect Duchess Says to invite fans onstage, sprinkle glitter on the crowd and maybe even crowdsurf a mannequin. Yamantaka // Sonic Titan, meanwhile, will no doubt come fully decked out in makeup and costumes. Hell, they even put on their own rock opera in 2012. With all this in mind, Exclaim! is excited to co-present this tour with Heavy Trip in celebration of our 25th anniversary. 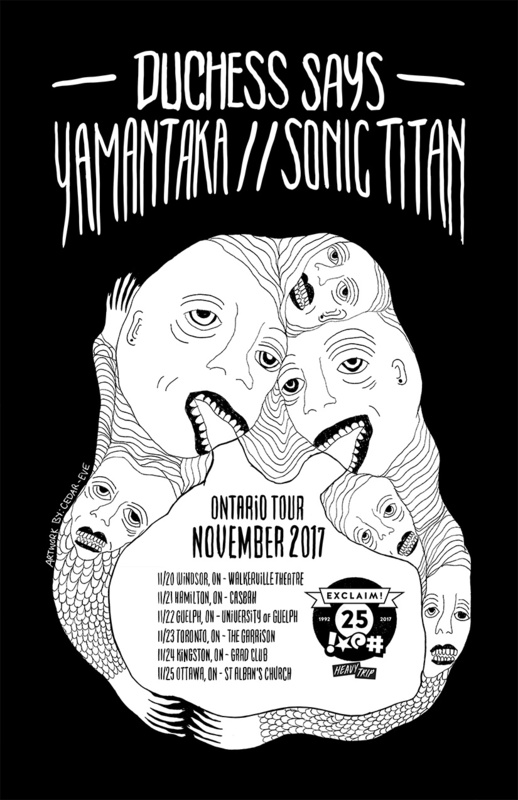 This marks Yamantaka // Sonic Titan's first tour since their major lineup change in 2015, which saw the departure of founding member Ruby Kato Attwood. The new incarnation of the band have been working on an upcoming full-length. Meanwhile, Duchess Says have been performing frequently since releasing Sciences Nouvelles last year; they previously celebrated our 25th anniversary with us during Canadian Music Week.